At a recent Nassau Suffolk Water Commissioners’ Association (NSWCA) training session, Mr. Joseph Frank, instructed the membership on Town Law Nassau County Civil Division and Statutory Guidance for Water Commissioners. Mr. Frank, a principal of Sapienza and Frank, Attorneys at Law (Massapequa, NY) discussed the History of Town Law, which was established in 1932, as well as the relationship, powers and duties of elected commissioners. This included limitations and what constitutes a conflict of interest. 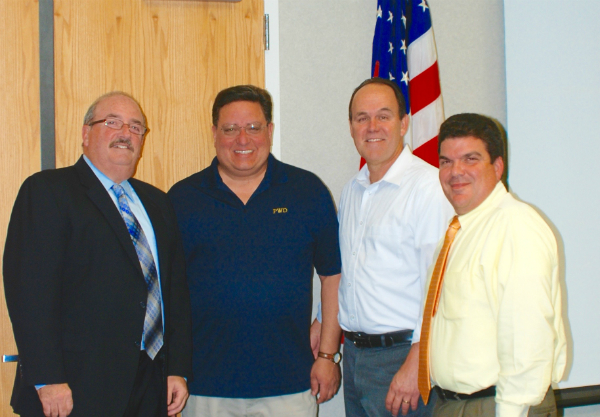 Photo L to R: Joseph Frank, Commissioners Andrew Bader, Thomas Hand and Vincet Abbatiello. The comprehensive training session included Section 211, which covers voting eligibility and annual elections and General Municipal Law 18, which defines Contract, Interest, and Municipality and Municipal Officer duties. In addition, Mr. Frank instructed the group regarding The Nassau County Civil Divisions Act, which became law in 1939 and established provisions regarding the operations of Water Districts in Nassau County. A vigorous question and answer period followed the presentation. A graduate of Manhattan College where he received his Bachelor’s Degree in Government, Mr. Frank earned his law degree from Hofstra University School of Law. He is one of the founding partners of Sapienza and Frank which was established in 1989 and specializes in Municipal Law.